It's a strange week when you can say a million dollars being paid for a comic book isn't unexpected, but that's exactly how it's played out this week. 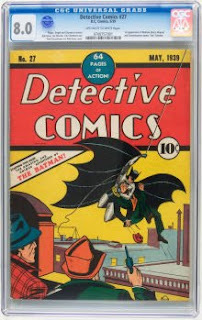 When ComicConnect announced its private sale of Action Comics #1 for $1 million earlier this week, one industry observer I spoke with said it was likely timed to get in front of the scheduled close of an auction today by Heritage Comic Auctions for the first appearance of Batman in Detective Comics #27 (May 1939) — which the insider said was expected to become the first million-dollar comic book. The 8.0 (Very Fine) copy of the first appearance of Superman indeed set the record as the first million-dollar comic book, but the copy of Detective #27 in the same condition now holds the record for highest price paid for a comic book. Today's auction closed for $1,075,500, which includes a 19.5% Buyer's Premium. It's worth noting that these two sales represent appreciation over the initial 10¢ purchase price of 1 billion percent! There aren't many commodities that have appreciated to such a degree. Which comic book is more rare today? CGC has graded more copies of Detective #27 — 45 copies, less than half unrestored, versus 42 for Action #1 — although since owners can remove books from their holders and resubmit them, those figures may not be representative of what's out there. We are able to guess which book may have been more plentiful when it came out. Last year we reported on Audit Bureau of Circulation estimates for the Detective Comics Group for January 1939 — and as I noted, the May cover-dated #27 may well have come out in January. The Detective, More Fun, Adventure, and Action Comics issues for the month all added up to sales of 709,379 copies, so we're on our own to figure out which titles sold more than the others. There are a few dynamics that we can observe from other titles that may advise us. First, in the 1950s, higher-numbered issues were generally more desirable to retailers, since they connoted longevity and an existing audience — but I'm not sure that dynamic was in effect in the late 1930s, when there weren't so many titles fighting for rack and shelf space yet. We see in Famous Funnies some declines as issue numbers increased, but that may also be attributable to the subject matter and the vagaries of that particular publisher's distribution. So it's not clear how the distributor draws — the number of copies distributors took to ship to newsstands — on a lower-numbered Action would compare to a higher-numbered Detective. Adventure had begun as New Comics, becoming New Adventure and finally just Adventure as action comics came more into vogue; More Fun, beginning as the oldest DC comic book, New Fun, had dropped humor covers in early 1938. My sense is that probably the twelfth Superman outsold the first Batman despite Action Comics being a relative newcomer — and that the twenty-seventh Detective might have undersold longer-established More Fun and Adventure, meaning it'd have sold fewer than the 177,345 copies that an even four-way split may suggest. That's certainly not reflected in the number of issues found and graded for those books, of course, but nothing nearly as interesting as the debut of Batman went on in those issues of Adventure and More Fun! It's all guesswork, to a great degree; the Audit Bureau simply didn't break out the individual titles. But there's not really room in the reported aggregate number for any of them to top a quarter-million copies, and my hunch is that 12 months was enough for even the glacially-responding newsstand market to recognize that Superman was a powerful draw. He'd have his own second title (simply called Superman) in a month or so after Batman's debut. So Action #12 very likely outsold Detective #27 — and my hunch is that Action #1 probably did, too. But today, in the aftermarket competition, Detective #27 has taken the prize — for now!